The First Lady’s Medal is Inspired by Floridians Making a Positive Impact in Their Communities. Jacksonville, Fla. – Today, First Lady Casey DeSantis, joined by Governor Ron DeSantis and Florida Department of Education Commissioner Richard Corcoran, awarded the inaugural “First Lady’s Medal for Courage, Commitment, and Service,” honoring Floridians who are creating positive change in their communities. First Lady DeSantis presented the medals to First Coast residents Carmen Townsend and Judi Zitiello at the North Florida School for Special Education. Both Carmen and Judi are well known in the community through their involvement in the JT Townsend Foundation and the Funk-Zitiello Foundation. Carmen Townsend is the proud mother to the late JT Townsend, a former wide receiver and member of the Episcopal School of Jacksonville Football Team. JT suffered a spinal cord injury in 2004 and later met professional golfer Fred Funk and Tommy Zitiello. When informed that JT and his family needed a wheel-chair accessible home, the pair, along with several North Florida community leaders, ensured that the Townsends had the equipment and support they needed. Later, the families came together to establish the JT Townsend Foundation to improve the lives of others living with disabilities. JT believed in the mission and continued to better himself by completing his undergraduate degree at the University of North Florida. JT passed away suddenly in 2013, but his legacy continues through the foundation in his name. Carmen now serves on the JT Townsend Foundation Giving Committee to continue JT’s legacy of providing hope to those living with disabilities. Judi Zitiello has been a member of the JT Townsend Foundation since 2010. She continues to support the mission of improving the lives of adults and children living with disabilities as she battles pancreatic cancer. Since her diagnosis in 2014, Mrs. Zitiello has been a voice and champion for all of those living with cancer and disabilities. The Funk-Zitiello Foundation was established alongside the Fred Funk family in 2016 to support families living with disabilities through the JT Townsend Foundation and to support critical pancreatic cancer research through the Mayo Clinic. 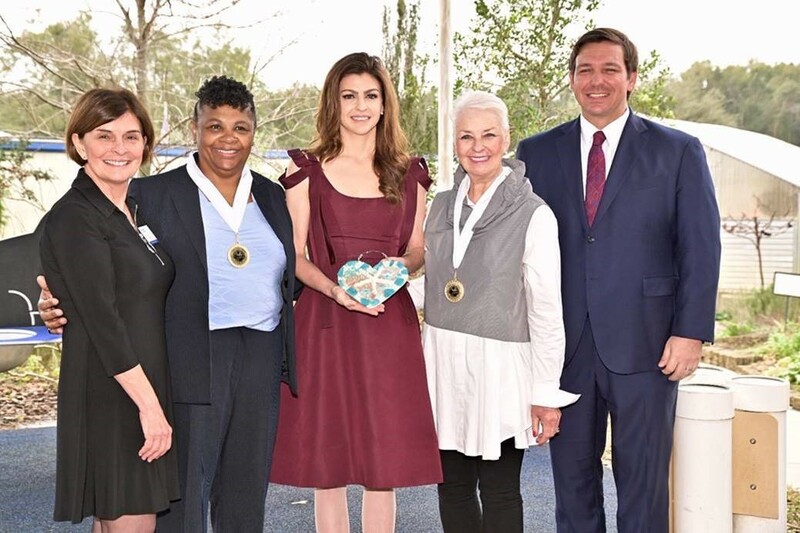 The First Lady’s Medal for Courage, Commitment & Service was established by First Lady Casey DeSantis in 2019 to honor Floridians who have made a positive impact in their communities.